The month of January was mainly seasonable with extreme temperatures taking place at both ends of the month. Highs for the month of January in Salisbury and Georgetown were above average by at least 1.5 °; while lows were slightly below average in Salisbury by 0.5°, but 1.5° above average in Georgetown. Highs in the 30s and 40s were the most common readings on Delmarva throughout the month, with most 50s occurring during the 1st 10 days of the new year. The three 60s observed in January were influenced by a strong push of southwesterly winds ahead of powerful cold fronts; while the highs in the 20s took place twice and it was during the final 10 days of the month. Lows in the 20s and 30s were heavily common throughout Janaury. The two 40s took place within the 1st 5 days of the month, while the 5 lows in the teens occurred in the last half of the month. 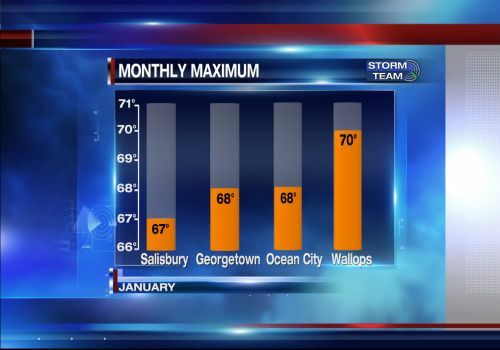 The warmest day of January was on the 1st when highs climbed into the upper 60s to 70°, where record highs were achieved in Wallops and Georgetown. Lows on the 1st day of the new year were above the average high for the month in the mid to upper 40s. The last day of January was quite the contrary, as all of Delmarva achieved its coldest readings of the month. Lows on the 31st were in the low 10s, with a record cold high achieved in Salisbury of 23° and tied in Georgetown at 23°. Rainfall amounts for the majority of Delmarva were above average with most receiving from 3 to 4.5 inches. 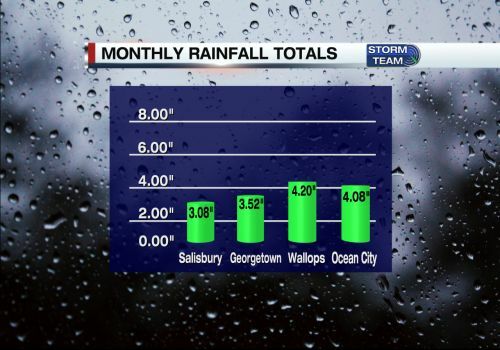 Salisbury was the only one of the 4 stations reporting a below average month of rainfall by only half an inch. Most of the systems that came through Delmarva in January brought mainly rain, with the exception of one that brought snow. The winter storm on the weekend of Janaury 12th and 13th, brought the only snowfall for the peninsula. This system was a snow maker in the beginning and end portions of the storm; with rain falling in between on the morning of the 13th. 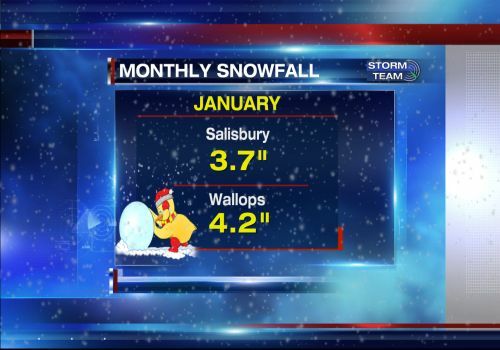 Monthly snowfall totals for Salisbury in the month of January were 3.7″, while Wallops received a slightly heavier amount of 4.2″. 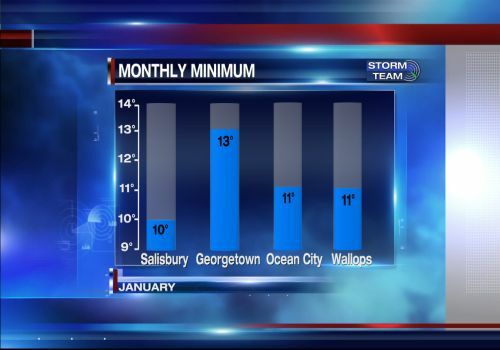 Wallops also set daily snowfall records on the 12th and 13th with 1.5″ and 1.7″ respectively. A majority of the cold fronts that swung through Delmarva in January, besides bringing rain or snow, were heavily bringing the wind. The heaviest wind gusts observed were in Ocean City at 64 mph on the 24th and Lewes at 51 mph on the 20th. The 2nd half of the month was particularly blustery with wind advisories being issued by the National Weather Service. The strongest cold fronts of the month also took place during the 2nd half, which also triggered wind chill advisories to be posted, from the frigid northwest winds. The month of February started with snow on the 1st and the coldest morning of the season so far on the 2nd with a low of 8° recorded in Salisbury. The 1st week of February however is shaping up to be a mild one with 60s sprinkled out through the majority of the workweek. Stay tuned with our Storm Team to find out how the rest of the month will play out.